On Friday, I held my last Creative Writing class of the academic year at Northbrook College– my Summer Surgery. I had a lovely class, but the heat was something else and by the end of the day we were all shattered. They are busy fitting aircon units in the classrooms, but sadly, they aren’t yet operational. In the evening, we drove over to my daughter’s to pick up my eldest granddaughter (I’m still wrapping my head around that phrase) and managed to fit in a bit of cuddle-time with Baby Eliza, who is growing like a weed. Yesterday, we were at Tim’s to celebrate his 16th birthday party – it seems no time at all since I was holding him when he was Eliza’s age… where do the years go? The teens had a great time with the karaoke equipment with lots of loud singing and laughter. We are travelling back to Brighton with Frances later today. After serving out a year of hard labor in the salt mines of Endovier for her crimes, 18-year-old assassin Celaena Sardothien is dragged before the Crown Prince. Prince Dorian offers her her freedom on one condition: she must act as his champion in a competition to find a new royal assassin. Her opponents are men-thieves and assassins and warriors from across the empire, each sponsored by a member of the king’s council. If she beats her opponents in a series of eliminations, she’ll serve the kingdom for four years and then be granted her freedom. Celaena finds her training sessions with the captain of the guard, Westfall, challenging and exhilarating. But she’s bored stiff by court life. Things get a little more interesting when the prince starts to show interest in her … but it’s the gruff Captain Westfall who seems to understand her best. 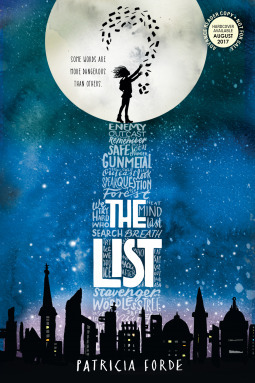 This YA fantasy has plenty of the themes and ingredients that make this sub-genre so popular. Ten years ago, the Kinslayer returned from the darkness. His brutal Yorughan armies issued from the pits of the earth, crushing all resistance, leaving burnt earth and corruption behind. Thrones toppled and cities fell. And then he died. This intriguing epic fantasy quest starts where most books finish – when the war is won and the wicked despot has been overthrown… Written with Tchaikovsky’s customary skill and insight, this book delivers a cracking adventure and food for thought. This is an absolute gem. I had no idea when I first opened it up that it would be such a rich, engrossing read – but it’s a 10 for me… Wonderful mystery whodunit set in a post-apocalyptic world. Fun Fact Friday with Franky’s Fun Flamingo Facts https://wandaluthman.wordpress.com/2018/07/20/fun-fact-friday-with-frankys-fun-flamingo-facts-3/ I’m a real fan of these articles – particularly this one. I did NOT know that about their legs – did you? Indian Biscuit https://historyofkingpanwars.wordpress.com/2018/07/20/indian-biscuit/ These look delicious! I thought this a fascinating premise and am always attracted by a YA dystopian science fiction world as a number of them have proved to be interesting and enjoyable reads. As you can see, there are some heavy-duty events along with the resultant emotional cost going on in this story. I had thought the sibling relationship would the at the heart of the story. In the event, because this is an action-led adventure rather than all about the characters, while it is an important part of the plot, it doesn’t particularly drive it forward. Apart from anything else, the sisters spend a significant part of the book at cross-purposes with each other. To be honest, I’m still not completely sure of my response about this one – there is a great deal of action and the world is bleakly awful, with a psychotic monster running the City of Graven. The consequences of existing within such a dark landscape, pervaded by loss are clearly spelt out – alcoholism and suicide are depicted within the story by some major characters and kudos to Sulich for having the courage to depict protagonists who are not invincibly cheerful in the face of hopeless odds against them. But I did find the plot looped along a pattern, where something bad happens, one of our protagonists is cast down, painfully rallies to the point of fighting back, only for something else bad to happen so that they are cast down, before rallying… And this happened to most of the main protagonists. Fortunately, the final climax broke free from that. I found the City of Graven really fascinating and would have liked a bit more insight into exactly how it was set up and why. Overall, it was an action-packed, intense read and is ideal for fans of YA dystopian worlds where it’s all about what happens next. 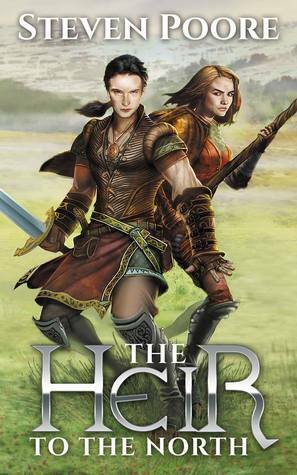 There has been much excitement amongst the book-blogging community about this one, as Jen Williams has become a solid favourite among epic fantasy fans with her unique blend of clever pacing, vivid characters and the sheer energy of her writing. But what had everyone waiting for this one was that twist at the end of The Ninth Rain – see my review here – that turned this into a genre mash-up. For starters, if you’ve picked this one up without having first read The Ninth Rain, then put it right back down again and rush off to get hold of the aforesaid first book in the series. It took me a while to get into this one, because I don’t reread books and as The Bitter Twins picks up more or less where The Ninth Rain left off, I was frankly floundering. If I hadn’t read the first book in this series, I think it would have taken me far too long to sort out who was doing what to whom to fully appreciate the writing and the story. However, once I was back in the groove – this one was a joy. The characters are nuanced and three-dimensional, so that our gutsy heroes and heroines have flaws and weaknesses, and even characters we have written off as wrong ‘uns are capable of selfless acts. I loved the storyline regarding the origins of the Eborans, which worked really well and nicely mirrored what is happening on the Corpse Moon where unsettling transformations are taking place. One of the recurrent themes within the epic fantasy genre is the role of history and how it defines people’s own identity within their culture and race. Williams treatment of this theme in this series is an interesting one, overlaid as it is by the insertion of another genre and how that both plays with and subverts the idea of cultural identity, particularly by the Eborans, who are teetering on the verge of extinction. As the inferior race, the human protagonists within the story have their own baggage and, in some cases, scores to settle. My favourite character is Vintage, the delightful human scholar whose insatiable curiosity has hauled her right into the middle of the current mess. I don’t want you to go away with the idea, however, that this book spends pages discussing or worrying about the above, as it’s all about the adventure and such considerations are fully embedded within the plot. Events are moving fast, threats abound, and our intrepid band of protagonists are constantly having to react to yet another sticky situation. The pages flew by as I found it hard to break off and get on with the growing stack of chores – so I didn’t. After all, this was a Jen Williams read – which means it’s something special. 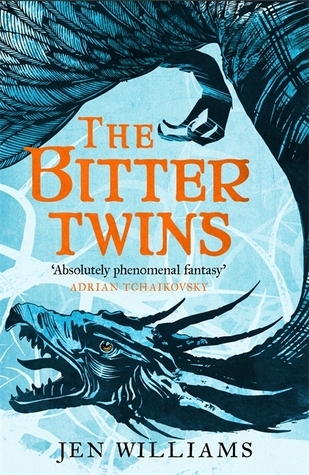 While I obtained an arc of The Bitter Twins from Netgalley, the opinions I have expressed are unbiased and my own. I spotted this offering on Netgalley and really loved the sound of it, so requested it and was delighted to be approved, given that VanderMeer is a talented author with a gift for writing the disturbing – see my review of Annihilation. Rachel survives as a scavenger in a ruined city half destroyed by drought and conflict. The city is dangerous, littered with discarded experiments from the Company—a biotech firm now derelict—and punished by the unpredictable predations of a giant bear. Rachel ekes out an existence in the shelter of a run-down sanctuary she shares with her partner, Wick, who deals his own homegrown psychoactive biotech. One day, Rachel finds Borne during a scavenging mission and takes him home. Borne as salvage is little more than a green lump—plant or animal?—but exudes a strange charisma. However, in a world where any kind of weakness is lethal, can Rachel afford to bond with this odd creature? 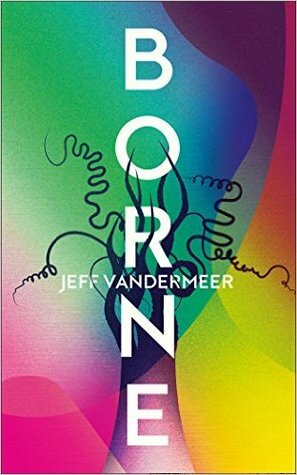 VanderMeer’s atmospheric writing spins a stunningly vivid evocation of this wrecked landscape where Mord, the gigantic bear, stalks through the city peopled by knots of scavengers – some of whom have been altered and twisted by the biotech that has escaped into the environment. The river is poisoned, the rain toxic and people eke out a subsistence existence. Rachel’s story is one that is probably heartbreakingly familiar in any refugee camp throughout the world. She recalls a happy family life with her parents, both with solid jobs and plenty of love for their only daughter, but as the sea levels rose and law and order broke down, they ended up in camps. She is unsure how exactly she has arrived in the city, scavenging and teaming up with Wick, a former employee of the Company with dark secrets of his own, but they are holed up in a defensible apartment block and coping reasonably well. Rachel is a striking protagonist. It is always a tricky business writing a character where a defining aspect of the protagonist is left to the climactic final scene of the book – and to be honest, about halfway through I was feeling a bit fed up that she didn’t ring completely true. By the end, the reason why becomes clear. VanderMeer’s writing always burrows beneath the surface and often finds the darkness lurking there – this time around, he has also celebrated what defines us as humans. If you are a fan of interesting, post-apocalyptic reads, then give this one go. I’ll guarantee it will stay with you.